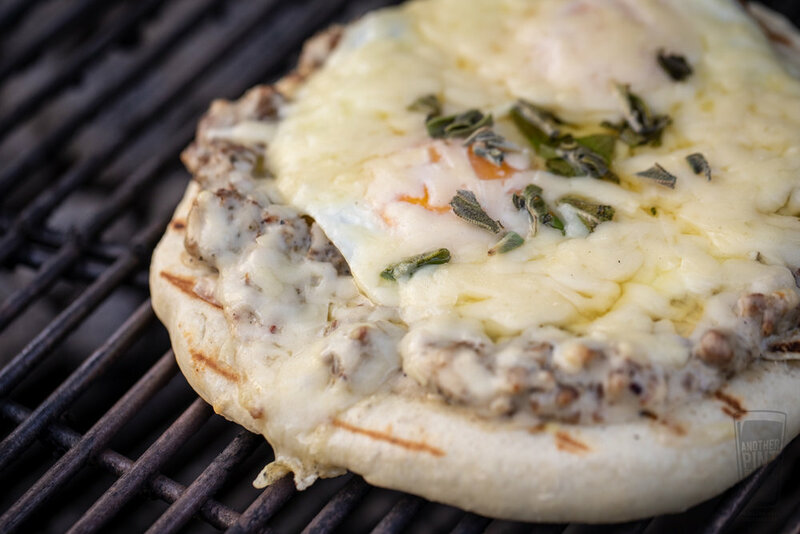 For over a year, I’ve had a note titled “Grill Breakfast Pizza.” Every time I scroll past it I think, wow, that’s a great idea, I should do it. Then I don’t. Last week I caught up with my friend Brad, shared some bourbon, and talked about grilling on our Weber Summit Charcoal Grills. As we ruminated, Brad mentioned he just grilled a breakfast pizza. He topped it with sausage gravy, eggs, and gruyere cheese. I immediately thought back to my unchecked to-do. Our afternoon session came about because as Brad learned when we talk about getting together, we have to put it on the calendar. Otherwise, we won’t. So, when we spoke the week prior, we mentioned getting together and made the appointment. Keeping with the idea of follow-through you can guess what I grilled for breakfast the next morning. Finally! The Summit Charcoal Grill is my go-to pizza oven. Almost every time I make pizzas, I opt to move the charcoal grate to the lower level and use the heat deflector to rock out 600° F on the baking stone. Here are my detailed instructions on making the dough and setting up the grill. This morning, for the sake of time, I opted to grill my dough directly on the grates. The previous night I choked out my remaining fuel and didn’t want to mess around taking the briquettes out to move the charcoal grate. Dough on grate grilling it is. For the absolute best tasting pizza dough, a slow and cold rise works wonders and unless you are a really early riser, when considering pizza for breakfast, its best to make the dough ahead and refrigerate overnight. I love sausage gravy, but oddly enough, have never made it. This recipe from the New York Times is simple, straightforward, and delicious. My only change was to use a sweeter maple pork sausage balanced out with more red pepper flakes. With the dough out of the fridge for about an hour, split the ball in two and roll out. 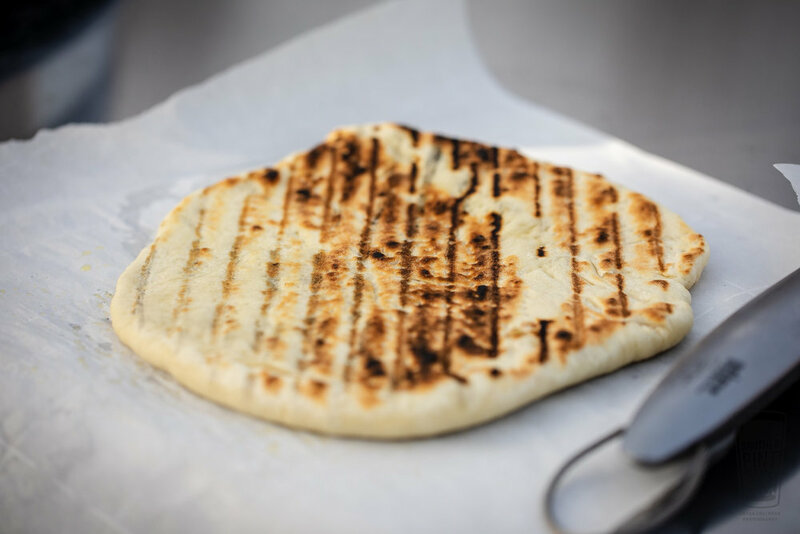 Since this is on-grate grilling, place the dough on parchment paper and to reduce the chances of the dough swelling when cooking, pierce all over with a fork. Prepare the grill for medium-high heat (400° to 450° F) with a two-zone fire. Lightly brush olive oil on the top of the dough. Place the brushed olive oil side directly on the grates and grill over direct heat for approximately one minute. Remove from the grill and place the uncooked side directly on the parchment paper. Top the grilled side with sausage gravy. Followed by two eggs, partially cooked sunny side up in a skillet, about a half cup of freshly grated gruyere cheese, and some fresh roughly chopped sage. Grill the pizza over direct heat for one minute and then slide to indirect heat. Continue to grill another five to seven minutes or until the cheese has melted and the dough cooked through. For as long as I’ve been meaning to make this, it didn’t disappoint. Many thanks to Brad for the idea and reminder. Now when are we getting together again? I’m sure I have other reminders needing inspiration.